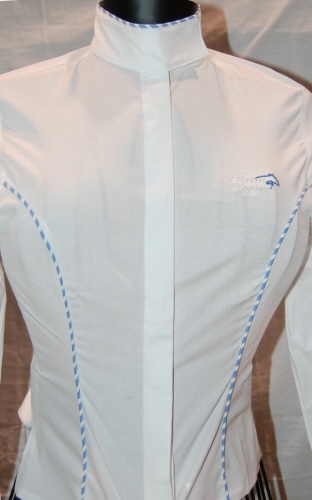 Sarm Hippique's Children's Sleeveless Show Shirt. Children's Show Shirt is without sleeves when the little ones should not have to withstand the heat, with an adjustable concealed Velcro closure collar for easy access and no fussing and 100% Cotton will keep them cool and comfortable. The Show Shirt is enhanced with pink candy stripe piping for that added distinct look. 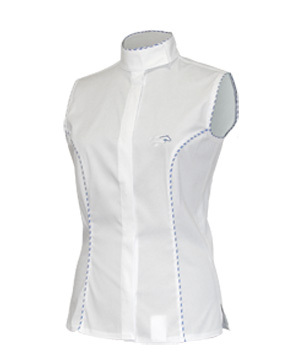 Sarm Hippique's Children's Sleeveless Show Shirt. Children's Show Shirt is without sleeves when the little ones should not have to withstand the heat, with an adjustable concealed Velcro closure collar for easy access and no fussing and 100% Cotton will keep them cool and comfortable. The Show Shirt is enhanced with light blue candy stripe piping for that added distinct look. Sarm Hippique's Children's Show Shirt. Traditional Childrens Show Shirt with an adjustable concealed Velcro closure collar for the little ones and 100% Cotton will keep them cool and comfortable. The tapered cut fits perfect under show coats and is enhanced with light blue candy stripe piping for that added distinct look.